I love a good flick. 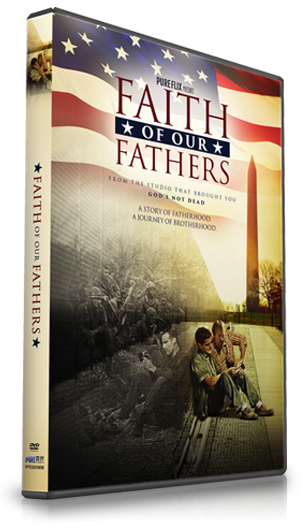 The new Faith of Our Fathers DVD from the studio that brought us God's Not Dead was a tear-jerker that I really enjoyed watching with my kids. It conveyed the story of two grown men who never knew their fathers; they go in search of the truth of how their dads lost their lives in Vietnam, and the film switches back and forth between the present and the past with vivid imagery and a great cast of characters. The two sons in the story start off on a bad foot, but end up great friends who come to understand the role that God played in their past -- and their futures. Through a narrative told via letters written in the war, this film balances Christian themes with a great historic nod to the bravery of our armed forces. It's perfect for watching on Veteran's Day! The movie stars Stephen Baldwin, Kevin Downes, David A.R. White, Rebecca St. James, Si Robertson, Candace Cameron Bure, Scott Whyte, and Sean McGowan. It's rated PG-13 for war themes, but it was perfectly appropriate for my whole family to watch together. Get ready to cry a few tears, it's a touching tale! Learn more about the Pureflix film at their website, Twitter, and Facebook! We also encourage you to pray for the veterans. Wanna Win? We are giving away one DVD to a lucky winner! Use the form below to enter by November 18th. Open to U.S. 18+ only. *Many thanks to Propeller Consulting, LLC for providing this prize for the giveaway. Choice of winners and opinions are 100% my own and NOT influenced by monetary compensation. I did receive a sample of the product in exchange for this review and post. Only one entrant per mailing address, per giveaway. If you have won a prize from our sponsor Propeller / FlyBy Promotions in the last 30 days, you are not eligible to win. If you have won the same prize on another blog, you are not eligible to win it again. Winner is subject to eligibility verification.